Offensively, Ryan McKenna is slashing .296/.387/.593 to go with a .980 OPS in his first seven games for the Glendale Desert Dogs. Five of his eight hits have been for extra-bases (three triples, two doubles) while he has driven in four runs and scored six more. Through two weeks of action in the AFL, the former Keys All-Star leads the league in three-baggers, is tied for the circuit lead in extra-base hits and is fifth in slugging percentage. Chris Lee saw only limited action in the 2018 regular season due to injury, but has thrown six scoreless innings over two starts for Glendale. He has allowed three hits, walked four and struck out six while limiting opponents to a .167 average (3-for-18). Lee's most recent start came last Wednesday at Scottsdale, with the left-hander tossing four scoreless innings of two-hit baseball. He walked one and struck out four. On Tuesday afternoon, Lee is slated to make his third start against Peoria. 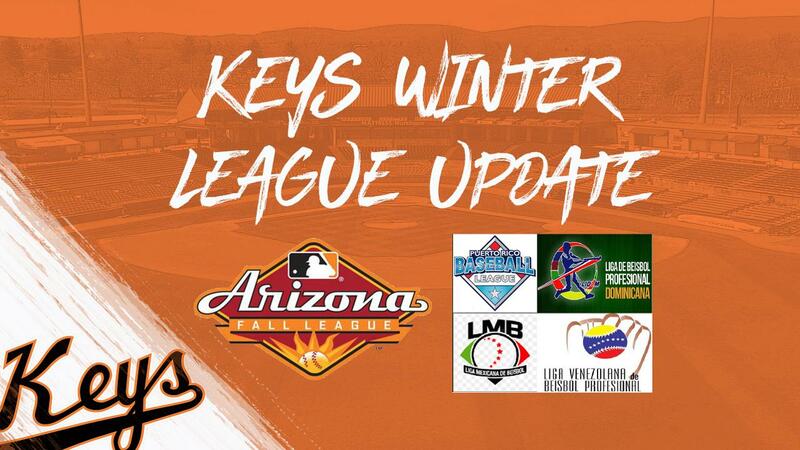 Another Keys all-star in 2018, Tyler Erwin has gone 0-1 with a 2.70 ERA in four relief outings for the Desert Dogs. After converting only one pro save in his first two seasons, the left-hander posted 18 this season to finish second in the CL and also led all Orioles minor leaguers in that category. Although not a member of the Keys since 2012, Garabez Rosa has established himself as one of the most consistent members of the Orioles farm system. Playing 127 games for the Triple-A Norfolk Tides this year, Rosa slashed .277/.297/.391 while hitting 11 home runs, 56 RBIs and 22 doubles in 127 games. Currently playing for los Gigantes del Cibao in the Dominican Winter League, Rosa ranks seventh in the league in hitting (.321) with a pair of doubles and four RBIs in seven games. Aderlin Rodriguez , a 2016 Keys alum, is one of Rosa's teammates.